Խալիֆը ուներ իր գանձարանը, ինչպես նաև անձնական ծառայությունները, որը ներառում էր նաև ռազմական անձնակազմը. Մուսթաֆա Քեմալը ասում էր, որ սրա համար չկա ո՛չ «կրոնական», ո՛չ «քաղաքական» արդարացում։ Նա կարծում էր, որ Աբդուլմեջիդ II հետևում է սուլթանների սկզբունքներին ներքին և արտաքին հարաբերություններում՝ ընդունելով և պատասխանելով օտարերկրյա ներկայացուցիչներին և պահեստային սպաներին, մասնակցելով պաշտոնական արարողություններին և տոնակատարություններին։ Նա ցանկանում էր միավորել խալիֆայության իշխանությունը Ազգային մեծ ժողովի իշխանության հետ։ Նրա սկզբնական գործունեությունը սկսեց 1924 թվականի հունվարի 1-ին, երբ Ինյոնյուն, Չաքմաքը և Օզալփը համաձայնվեցին վերացնել խալիֆայությունը։ Խալիֆը հայտարարեց, որ ինքը չի խառնվի քաղաքական գործերին։ 1924 թվականի մարտի 1-ին ԹԱՄԺ-ում (Թուրքիայի ազգային մեծ ժողով) Մուսթաֆա Քեմալը ասաց. 1926 թվականից հետո Մուսթաֆա Քեմալը սկսեց արմատապես հեռանալ Օսմանյան կայսրության կողմից իրականացված նախկին բարեփոխումներց։ Պատմության մեջ առաջին անգամ իսլամական օրենքը առանձնացվեցաշխարհիկ օրենքից և սահմանափակվեց միայն կրոնական հարցերով։ Քեմալն ասում էր. 1930 թվականի նոյեմբերի 30 Ալի Ֆեթհի Օքյարը լուծարեց իր կուսակցությունը։ 1945 թվականին Թուրքիայի Հանրապետությունում հաստատվեց երկարատև բազմակուսակցության համակարգ։ Փաստարկներ կան, որոնք ցույց են տալիս, որ Մուսթաֆա Քեմալի միակուսակցական համակարգը չէր նպաստում ուղղակի ժողովրդավարությանը։ Չնայած որ Քեմալը իր գործողություններում միշտ չէր ժողովրդավար` նա աջակցում էր քաղաքացիական հասարակության ձևավորմանը։ Իր ելույթներից մեկի ժամանակ խոսելով ժողովրդավարության կարևորության մասին՝ Քեմալը 1933 թվականին ասել է. 1934 թվականի դեկտեմբերի 5-ին կանայք ստացան քաղաքական իրավունքներ, նույնիսկ ավելի վաղ, քան շատ եվրոպական պետություններ։ Թուրքական քաղաքացիական օրենսգրքով սահմանվեցին ամուսնության մեջ կանանց հավասար իրավունքները։ Մուսթաֆա Քեմալն ասում էր. Մուսթաֆա Քեմալ Աթաթուրքը և նրա կինը՝ Լատիֆե Ուշաքլըգիլը, Բուրսա շրջագայության ժամանակ, 1923 թ. ↑ 4,0 4,1 German National Library, Berlin State Library, Bavarian State Library et al. Record #118650793 // Gemeinsame Normdatei — 2012—2016. ↑ 8,0 8,1 8,2 8,3 8,4 8,5 Ататюрк Мустафа Кемаль // Большая советская энциклопедия: [в 30 т.] / под ред. 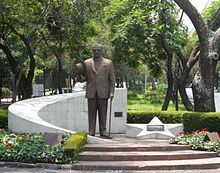 А. М. Прохоров — 3-е изд. — М.: Советская энциклопедия, 1969. ↑ 29,0 29,1 Nobel Foundation. The Nomination Database for the Nobel Prize in Peace, 1901-1955. ↑ Andrew Mango Atatürk: The Biography of the Founder of Modern Turkey, Overlook Press, 2002, 978-1-58567-334-6, p. 25, p.27ff. - "Feyzullah's family is said to have come from the country near Vodina (now Edhessa in western Greek Macedonia). The surname Sofuzade, meaning 'son of a pious man', suggests that the ancestors of Zübeyde and Ali Rıza had a similar background. Cemil Bozok, son of Salih Bozok, who was a distant cousin of Atatürk and, later, his ADC, claims to have been related to both Ali Rıza's and Zübeyde's families. 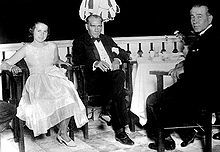 This would mean that the families of Atatürk's parents were interrelated. Cemil Bozok also notes that his paternal grandfather, Safer Efendi, was of Albanian origin. This may have a bearing on the vexed question of Atatürk's ethnic origin. 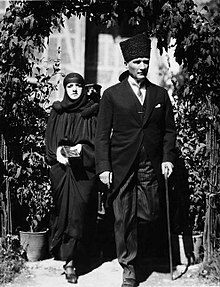 Atatürk's parents and relatives all used Turkish as their mother tongue. This suggests that some at least of their ancestors had originally come from Turkey, since local Muslims of Albanian and Slav origin who had no ethnic connection with Turkey spoke Albanian, Serbo-Croat or Bulgarian, at least so long as they remained in their native land. 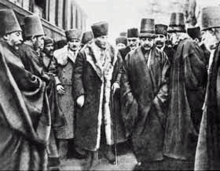 But in looks Atatürk resembled local Albanians and Slavs.[...] But there is no evidence that either Ali Riza or Zübeyde was descended from such Turkish nomads." page 28; "It is much more likely that Atatürk inherited his looks from his Balkan ancestors.[...] But Albanians and Slavs are likely to have figured among his ancestors." ↑ Cunbur, Müjgân. 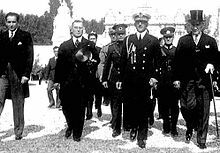 Türk dünyası edebiyatçıları ansiklopedisi, 2. cilt (2004), Atatürk Kültür Merkezi Başkanlığı: "Babası Ali Rıza Efendi (doğ. 1839), annesi Zübeyde Hanımdır, baba dedesi Hafız Ahmet Efendi, 14-15. yy.da Anadolu'dan göç ederek Makedonya'ya yerleşen Kocacık Yörüklerindendir." ↑ Mustafa Kemal Atatürk - memorial museum in village Kodzadzik in Municipality Centar Zupa. ↑ Gershom Scholem, "Doenmeh", Encyclopaedia Judaica, 2nd ed. ; Volume 5: Coh-Doz, Macmillan Reference USA, Thomson Gale, 2007, 0-02-865933-3, p. 732. ↑ Whether, like most Macedonians, he had about him a touch of the hybrid —perhaps of the Slav or Albanian—can only be a matter for surmise. Atatürk: a biography of Mustafa Kemal, father of modern Turkey, Baron Patrick Balfour Kinross, Quill/Morrow, 1992, 0688112838, p. 8. ↑ 53,0 53,1 T.C. Genelkurmay Başkanlığı Yayınları, ibid, p. 2. ↑ 61,00 61,01 61,02 61,03 61,04 61,05 61,06 61,07 61,08 61,09 61,10 61,11 61,12 61,13 Ana Britannica (1987) Vol. 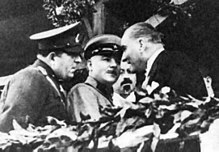 2 (Ami - Avr): Atatürk, Mustafa Kemal. Page: 490. ↑ Richard C. Hall, The Balkan Wars 1912-1913: Prelude to the First World War, Routledge, 2002, p. 81. ↑ Edward J. Erickson, Defeat in Detail: The Ottoman Army in the Balkans, 1912-1913, Praeger, 2003, 0-275-97888-5, p. 255. ↑ Documents on British Foreign Policy, vol. vii, p. 303. ↑ Kerr. The Lions of Marash, p. 196. ↑ 102,0 102,1 102,2 Wolf-Gazo, John Dewey in Turkey: An Educational Mission, 15-42. ↑  Archived 5 May 2008 at the Wayback Machine. 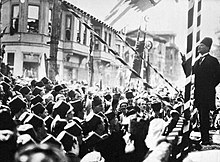 ↑ Landau, Atatürk and the Modernization of Turkey, 190. ↑ "Gazi, önerilen 14. soyadını kabul etmiş!". Habertürk. Retrieved December 18, 2017. ↑ Ayhan Aktar, "Cumhuriyet’in Đlk Yıllarında Uygulanan ‘Türklestirme’ Politikaları," in Varlık Vergisi ve 'Türklestirme' Politikaları,2nd ed. (Istanbul: Iletisim, 2000), 101. ↑ Vryonis, Speros (2005). 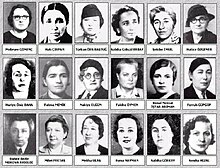 The Mechanism of Catastrophe: The Turkish Pogrom of September 6-7, 1955, and the Destruction of the Greek Community of Istanbul. New York: Greekworks.com, Inc. 0-9747660-3-8. ↑ Cagatay, Soner 2002 ‘Kemalist donemde goc ve iskan politikaları: Turk kimligi uzerine bir calısma (Policies of migration and settlement in the Kemalist era: a study on Turkish identity), Toplum ve Bilim, no. 93, pp. 218-41. ↑ Международная жизнь (the Soviet Foreign Minisrty's magazine). Moscow, 1963, № 11, pp. 147-148. The first publication of Kemal's letter to Lenin in excerpts, in Russian. ↑ Международная жизнь. Moscow, 1963, № 11, p. 148. 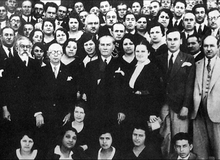 ↑ Yılmaz Altuğ, Türk Devrim Tarihi Dersim, 1919-1938, 1980 s. p. 136. ↑ John P. Kinross. Atatürk: a biography of Mustafa Kemal, father of modern Turkey. New York, 1965, p. 464. ↑ БСЭ, 1st edition, Moscow, Vol. 55, 1947, column 374. ↑ БСЭ, 1st edition, Moscow, Vol. 55, 1947, column 377. ↑ Yilmaz Altuð, "Atatürk'ün Dis Politikasý," B.Ü. Uluslararasi Atatürk Konferansý Tebligleri, 10-11 November 1980, Vol. II, Istanbul 1981, p. 486. ↑ Þevket Süreyya Aydemir, Tek Adam, Vol. 3, Ýstanbul 1988, p. 331. 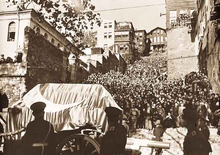 ↑ Atatürk'ün Hayatı (Atatürk's Life). Ministry of Culture and Tourism (Turkey) (թուրքերեն).